Either term is acceptable in our opinion. The term "buffalo" is somewhat of a misnomer when referring to plains bison. The bison is a distant relative of the two true buffalo, the Asian water buffalo and the African buffalo, but it's more closely related to the European bison. That said, Native Americans and others commonly refer to the animals as buffalo, as we consider both terms to be correct. Why is bison conservation important? Tens of millions of bison roamed North America when Europeans first arrived. As the continent’s largest land mammal, bison were crucial in shaping the prairie ecosystem. Their massive size made them an attractive—but extremely formidable—prey for prairie wolves, grizzly bears and Native Americans. Their carcasses offered nourishment to smaller animals and plants. Not only did the bison nearly vanish from over-hunting in the late 1800s, but also gone were the far-reaching effects they had on the prairie ecosystem. The bison’s recovery has been slow and is far from complete. Only about 20,000 now exist in herds managed primarily for conservation purposes, far fewer than are needed for them to even partially fulfill their former ecological role on the prairie. Moreover, most conservation herds are very small, numbering in the dozens to a few hundred, and are confined to small, fenced-in areas. These conditions threaten the genetic health of bison and greatly hinder their ability to roam widely and display natural behaviors. This combination of genetic, ecological and behavioral concerns makes bison restoration a high priority for wildlife conservation in North America. What is APR’s position on wild bison? The current situation in Montana, in which bison are considered livestock by the Montana Department of Livestock, is working fine for American Prairie Reserve. We are required by the Bureau of Land Management to pay the same Animal Unit Month (AUM) fees as any other producer to graze its livestock on public lands. If Montana Fish, Wildlife & Parks was to someday, even decades from now, succeed in reestablishing bison as wildlife in some areas of Montana, including in the six-county area around American Prairie Reserve, we would be fine with that arrangement as well. Otherwise, the Reserve will continue to operate under the current conditions described above. What are APR’s conservation goals for the bison herd? 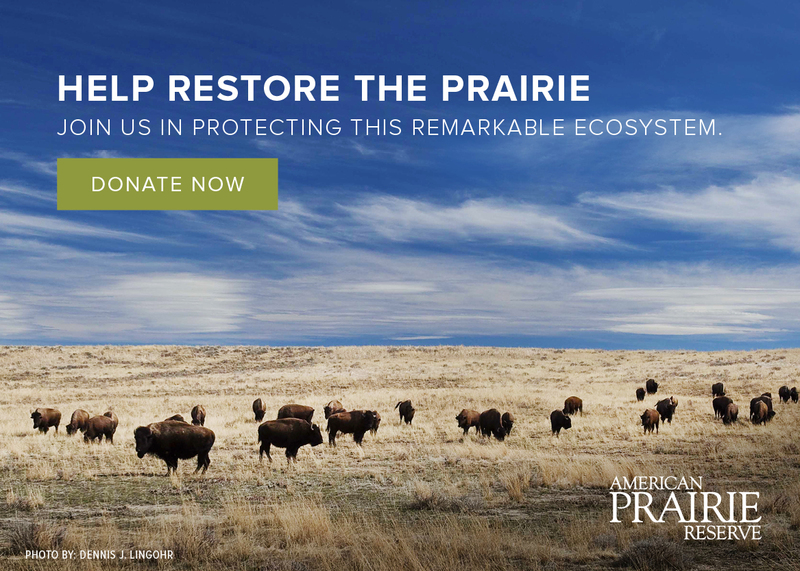 We should clarify a common misconception that American Prairie Reserve is primarily a bison conservation project. While certainly crucial in building the reserve, bison restoration is just part of a much broader set of goals to restore the vast and fascinating diversity of plants, animals and habitats that are native to Montana’s prairies. That said, we want to set the gold standard for bison conservation in North America. The management of our bison herd should be exemplary for how to restore and conserve the genetic, ecological and behavioral features of wild bison. In doing so, and by sharing our research and experience with others, we hope to inspire and support others who wish to restore bison elsewhere in North America, from Canada through the United States to Mexico. To achieve this, our four main goals are that the American Prairie Reserve herd: (1) have high genetic diversity; (2) be free of detectable cattle genes; (3) fulfill its crucial ecological role in shaping the prairie ecosystem; (4) display natural behavior. In addition to these biological goals, we want the Reserve’s bison herd to be enjoyed, with diverse cultural and economic benefits, by local communities and the public. All of these goals require that the Reserve’s herd grow to number in the thousands that are free to roam over millions of acres. Learn more about our goals and progress in our annual bison report. Why is genetic diversity in bison important and how does APR manage for it? Genetic diversity is important for keeping the herd healthy and adaptable. Low genetic diversity can cause abnormalities, low birth rates and reduced resistance to diseases. Good genetic diversity enables the herd to adapt to changes in their environment. Meeting this goal requires that we begin by using the best science there is to determine where we obtain bison for building our herd from and how to manage them. According to the latest genetic research, we need to build the herd, in the short term, to more than 1,000 animals to avoid genetic problems like inbreeding, and in the early stages we need to introduce animals that bring new genes into the herd. It also means that we must avoid management actions that, over the long run, might reduce diversity and breed wildness out of the herd, such as removing cantankerous bulls. A key requirement for maintaining the genetic health of the herd is to allow the animals to interact naturally with their environment. We therefore practice “hands-off” management as much as possible, which, in simplest terms, means allowing the weak to die and the strong to survive and pass on their genes. Bison have adapted and evolved according to the forces of natural selection over thousands of years and we want to ensure that they will continue to do so into the future. Why and how is APR restoring the ecological role of bison on the prairie? The bison’s historic ecological role depended on enormous numbers of free-roaming animals. Thus, our goal over the long term is to let the bison population grow to thousands of animals that are allowed to roam over vast areas of unfenced, native prairie. This will permit bison to graze the prairie according to their natural instincts, which generally results in some areas being grazed hard and others not grazed for years. This grazing pattern, especially when combined with fire that historically occurred on the prairies, results in a diversity of habitats (scientists call this “habitat heterogeneity”), which, in turn, supports a great diversity of wildlife. For example, areas that are grazed hard have short vegetation that some bird species such as McCown’s Longspur and the Ferruginous Hawk prefer, whereas ungrazed areas with tall vegetation are used by other bird species, such as Sprague’s Pipit and Baird’s Sparrow. Bison also affect habitat by repeatedly rolling in the dust or mud in selected spots, a behavior called wallowing. The resulting shallow depressions, called wallows, may fill with water in the spring and become mini-wetlands with distinctive vegetation. And, because of their large size, bison are an important protein source for scores of predators and scavengers and their decomposing bones create rich patches of nitrogen and phosphorus for plant growth. These and many other interactions between bison and their environment are central to creating the diverse, abundant, and fascinating life of the prairie ecosystem. Meeting this goal requires that we continue to build both the herd size and the reserve’s land base over which they roam. How does APR manage diseases such as brucellosis in its bison? We follow the very same guidelines for disease control that cattle ranchers do, as required by the Montana Department of Livestock (MDL). There is no brucellosis in our bison herd and, to ensure it stays that way, when importing animals we first make sure they come from brucellosis-free stock, as is the case with the bison from Alberta’s Elk Island National Park that we have introduced. In all cases, we strictly follow MDL regulations regarding any disease testing and vaccinations. Why does APR want to avoid cattle genes and how does APR manage for that? Years ago there were many attempts to crossbreed bison and cattle with the goal of producing heartier domestic cattle or meatier and easier-to-handle bison. Neither worked very well. However, the result is that most bison today harbor some domestic cattle genes in their DNA, a condition that scientists call “cattle-gene introgression.” Although the amount of cattle genes is generally very low—less than two percent in most conservation herds—and bison with low levels look like wild bison, little research has been conducted to assess what, if any, effects cattle genes may have on bison. Some cattle genes, for example, might affect the metabolism of bison, which, unlike cattle, slows down significantly in winter. This might compromise their ability to survive severe winter weather in places like American Prairie Reserve. Our bison herd is one of only a handful of herds in North America that, based on the best genetic research available, shows no signs of cattle genes. Over the past five years, SNPs (single-nucleotide polymorphism) analysis has been shown to be far more effective at detecting cattle gene introgression compared to older mitochondrial tests. We therefore have taken a precautionary approach by working to avoid cattle-gene introgression. This includes occasionally culling animals with cattle genes from the herd. We do this not only to avert any potentially deleterious effects of cattle genes, but also because non-introgressed bison herds are rare and represent a distinct genetic resource for bison conservation. Another reason for this management policy is that we want to make sure that our bison meet any standard for cattle-gene introgression that state or federal wildlife agencies might impose if, some day, they want to use our bison to establish a wild herd in or around American Prairie Reserve. Importantly, our bison management follows the recommendations of leading geneticists and bison managers convened by the American Bison Society who confirmed the importance of conserving bison herds without signs of cattle-gene introgression. That said, conservation herds with very low levels of cattle-gene introgression are also important because they also conserve genetic diversity and can fulfill the ecological role of bison. Why can’t APR take bison that wander out of Yellowstone National Park and are at risk for slaughter? The relocation of bison from Yellowstone National Park is a complex issue. Bison that left the park, if they are not slaughtered, are sent to a quarantine facility where they are held for five years to ensure that they are disease-free before they leave the area. Those animals are controlled under the jurisdiction of the Montana Fish, Wildlife and Parks Department. Assuming quarantined bison were certified by the Animal and Plant Health Inspection Service (APHIS) as disease-free as well as determined to be free of cattle gene introgression by means of SNPs (single nucleotide polymorphism) testing, American Prairie Reserve would consider incorporating them into the Reserve population. Their inclusion with APR’s herd would be welcome since the addition of Yellowstone’s unique genetics would increase the APR herd’s hereditary variations, making the APR population even stronger and more resilient.